Launceston Fire Brigade Timeline | Launceston Then! It was not until the Great Fire of London that any real thought was given to organised and scientific fire-fighting, and only a few parishes and private households had thought it necessary to provide any equipment for this purpose. So when the dreaded cry of ‘FIRE’ went round the City of London, in the early hours of 2nd. September, 1666, the only appliances available consisted of a few hand pumps, called ‘squirts’, and buckets handled by untrained members of the public. The appalling devastation caused by this fire led to the formation of fire insurance companies and they in turn organised the first fire brigades to protect their clients, who were readily identified by wall plaques on the front of their property. These arrangements did not provide for co-operation between the various brigades and made no provision for people who had not insured against fire. Early in the 19th. century many insurance brigades united with smaller parish volunteer fire parties, and several district authorities, particularly in the large towns, formed the first municipal brigades, which as a matter of convenience were in some instances combined with the police force. These early fire brigades were few in number and rarely attended fires outside their own area. Therefore large rural districts remained without any protection whatsoever, and it was not until 1938 that an act was passed making fire protection compulsory everywhere in Britain. At that time there were over 1,700 fire brigades. With the threat of a second world war the Auxiliary Fire Service was formed, and in 1939, when war was declared, the ‘A.F.S.’ supplemented the regular brigades. In 1941 an Act of Parliament transferred all municipal brigades together with the A.F.S., to government control, and formed the National Fire Service. After the war the Fire Service was ‘de-nationalised’ and placed under the control of County and County Borough Councils. Some of them combined to form a total of 134 Fire Authorities. From the metal ‘squirt’ of the 17th century the manual engine pump was developed by British and Dutch engineers. This pump was the first to provide a continuous stream of water and a leather hose was used. The first steam-driven and horse-drawn fire engine was built in 1858 by Shand Mason of London, and this type of fire engine was in general use until replaced by petrol driven engines and diesel engines with turbine pumps. The Lead Wall Plaques were placed on buildings by the Insurance Companies to indicate to their fire brigade which building to care for in case of fire. In 1707 30 men from each office were exempted from liability to impressment. During the 18th century each Fire Insurance Company had its own firemen. No home was considered a ‘secure house’ until the fire mark was actually affixed. The firemen were known by the name of the fire-office to which they belonged. In 1805 the Sun Fire Officers wore a silver arm badge of their fire-office. The Mayor requests us to publish the following correspondence in connection with a proposal for the formation of a fire brigade in the town. Launceston, 29 November, 1864: Last evening at a meeting of the Council, one of the Councillors said that you had kindly expressed your readiness to aid in forming, and to take command of, a fire brigade for Launceston. The names of some respectable persons willing to be of your ‘Company’, were also mentioned. The Council desired me to thank you for your suggestion, and to assist in the object of it, if I can. I shall be happy to make the attempt. At your convenience will you favour me with an outline of your plan? I fear that the services of the brigade must, in the main, be rendered gratuitously. Yours very truly, Richard Peter, Esq. John Dingley, Esq., Launceston. Launceston, November 29th, 1864. Dear Sir: I certainly suggested to some one or two persons I met the propriety of forming a fire brigade but ‘taking the command’ is a different thing, and I am not aware that I ever offered to do so. I should however, be glad to assist in forming such a brigade, and in making some rules and arrangements for its being carried out. My plan, which yet requires to be carried out in detail, is something of the following:- A company of volunteers to be formed consisting of about twice as many as would ordinarily be required to work an engine and manage the hose, with a view to a due allowance absentees. These men should all have specified duties in case of fire and should be able, on being so ordered, to fall into any kind of work. There should also be two or three taking a position, something akin to officers, in order that one might always be present to give orders in case of fire. The only paid officers connected with the brigade should be:- first, a mechanic having charge of the engine, and if a carpenter, and accustomed to a ladder, he would most likely be the person to direct the pipe: second, the person in charge of the fire-plugs. The men should meet for drill once a month, and should be prepared to assemble at any time on a given signal. The uniform might be a brown Holland blouse, with a red belt and a hard oiled wideawake to protect the head. To make the engines efficient, they should either be mounted on springs and wheels, or carriages should be provided to place them on, and an arrangement should be made with some postmaster to provide horses in an emergency. There must also be a better place for keeping the engines, and someone to keep them in good repair. If the engines are to be separate from the carriages, these houses should contain stages on which the engines might be run up and passed to the carriages without delay. There should also be in some accessible place a fire escape or ladder on wheels which might be brought at once to the scene of a fire, and used either for aiding escape or mounting with the hose. As this is a country place, and fire-plugs are not as in large towns, to be found everywhere, there should be a good supply of buckets, which might go with the engine, and each engine should also be provided with a few tools, such as a pick-axe, crow bar, &c., &c. There should also be some provision for making an extempore tap at any fire-plug, so as to use buckets in a case like the fire at Mr Burt’s where the hose was not long enough to reach. Yours truly, John Dingley. – R Peter, esq. Launceston. Post & Weekly News, 10th February, 1872. The Mayor reported at Monday’s meeting of Launceston Town Council the state in which he found the fire engines and appliances belonging thereto; and the course he had pursued in order to remedy the defects. He thought two coats of paint were necessary to preserve them from damage. He had removed them to the Market House to prevent injury and for easy access; the keys were deposited at his house where they might be available at a moment’s notice. Before now a house might be burnt down before the engines could be made to work. With the policeman and inspector of nuisances, he hoped to form a volunteer fire brigade. A meeting was convened in the Town Hall to establish a ‘thoroughly efficient Fire Brigade for the use of the town and neighbourhood’, on the 28th of March 1872. The Falmouth Fire Brigade were invited to visit Launceston to show off their expertise and equipment..
Post & Weekly News: 6 April 1872: Launceston Fire Brigade. Satisfactory progress is being made in the organisation of this useful body. The following officers have been elected:- Mr Alderman Ching, Captain; Mr Charles Jenkyn, 1st Lt.; Mr Samuel Treleaven, 2nd Lt; Mr G. M. Gifford, treasurer & secretary; Mr W. H. R Atkins, asst. sec.. Upwards of 40 active and intelligent citizens have enrolled themselves as members. It has been decided to accept the offer of the Falmouth Fire Brigade to visit the town. LAUNCESTON VOLUNTEER FIRE BRIGADE: THE FORMATION. April 13th, 1872: Newspaper reports:– THE FIRE BRIGADE. The Falmouth Fire Brigade has accepted an invitation from the Mayor of Launceston, to visit this town on Whit-Monday, when they will bring their Fire Engine, scaling ladders, &c., and go through their different evolutions. They have by continual practice become very effective, and are now considered the most complete Brigade in the county. A concert will be given at the Western Subscription Rooms on the same evening, in which the Falmouth Brigade will take part – appearing in uniform. Particulars of the concert shall defray the expense of their visit, they themselves handsomely contributing £5. We are glad that a Volunteer Fire Brigade has been established, and we hope that it will meet with encouragement and support from all parties. LAUNCESTON FIRE BRIGADE. 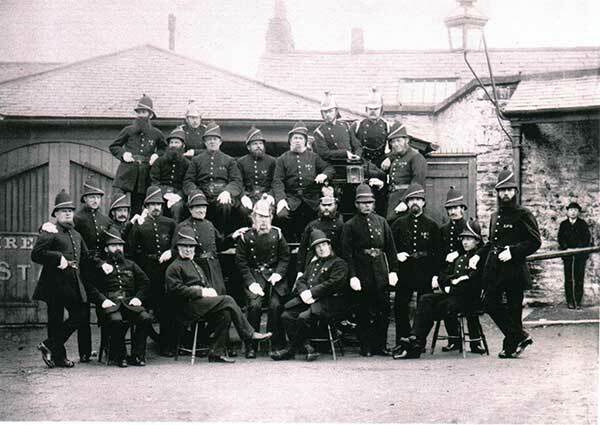 The visit of the FALMOUTH FIRE BRIGADE to Launceston will be held [d.v.] On WHIT-MONDAY, MAY 20th. A concert by the Launceston amateurs, assisted by the Falmouth brigade Will take place in the evening. Further particulars will be announced in due course..
Gifford, Hon Sec & Treasurer. April 12, 1872. I have often noticed the benefits resulting both to town and country from establishments of this kind when well-managed, and I doubt not [from the energy with which things are generally undertaken in Cornwall] this will be the case. I am informed that the Brigade will shortly be in a position to render their services, if required, in the surrounding neighbourhood. Yours truly, A Commercial Traveller. The White Hart Hotel, Launceston. April 25th, 1872. The evening to conclude with a splendid display of fireworks by Mr MONK, of Tavistock, the celebrated pyrotechnist, in the castle green (immediately after the concert), to consist of many dozens of Sky-Rockets, Devices in Colours, Fires, large and small Wheels set with Brilliants, Pyramids, Line Rockets, Mines with Snakes, Crackers, Stars, &c, Mortars with Shells and Coloured Fires, Balloons, with other startling and beautiful effects. A cheap excursion train from Plymouth on that day, leaving Launceston at 7.30. pm. East Cornwall Times, 25th, May, 1872. FALMOUTH FIRE BRIGADE AT LAUNCESTON. Whit-Monday at Launceston was given over to matters of festivity in connection with an important question of local public policy – the establishment of a fire brigade. Now Launceston has been very fortunate in the way of fires. There has only been one worthy of the name during the present generation. Nevertheless the ancient borough was well provided with fire engines – for it had two – if only they had been fit to work. A good many of its people seem from time to time to have talked about prevention being better than cure, but nobody appears to have attempted to give practical effect to that sentiment until a few weeks since, when the Mayor, Mr W Derry Pearse, took the matter up energetically, and a fire brigade was formed. This force now consists of about forty members, under the following officers:- Captain Ching, Deputy-Captain and Surgeon Pearse (the Mayor), First Lieut. C. Jenkyn, Second Lieut. S. Treleaven, Secretary and Treasurer Mr G. M. Gifford. The first official act of the brigade was to get the engines put thoroughly in order; their second to seek advice as to the best means of organising and working. In order to carry out the latter object they resolved upon inviting the Falmouth Brigade, which is the oldest in the county, to pay them a visit, and they determined so to time it and arrange the details as to enable them to put a little money in their pockets – that article being needed for such matters as uniforms, improved fittings for the engine, and the like. The West of England Insurance Company promised £25; and they came to the conclusion that if the trip of the Falmouth Brigade were properly managed that sum would be considerably increased. Accordingly is was arranged that the Falmouth Brigade should run up to Launceston with their engine on Monday, and go through a drill in the streets, that subsequently their should be a concert in the Western Subscription Rooms; and that in the evening, Mr Monk, of Tavistock, should display his skill in fire works in the Castle Green. The programme was easily settled. The Falmouth Brigade were invited as guests, their Launceston brethren offering to pay all expenses. These, however, were materially reduced by Captain Olver and his brother officers contributing £5, whilst the authorities of the Cornwall Railway liberally agreed to take the party the double journey for the single fare, and to carry the engine free. Wet and dismal in the extreme was it when shortly before four on Monday morning the Falmouth Brigade assembled at their engine-house and marched to the station. Fortunately, the weather improved afterwards, and they were able to make the drive from Liskeard to Launceston – that being the route selected – in tolerable comfort. They were conveyed on the engine and in two waggonettes which had been sent to Liskeard to meet them, and drove by the shortest road, which is about 16 miles. Some of the hills, however, were enough to make even Mr Fell stand aghast, and as a consequence one of the linch pins dropped out and a wheel came off. It speaks well for the smartness of the brigade that the wheel was replaced and the engine again in motion in three minutes. The brigade were under the command of Captain Olver, First Lieutenant Latchmore, Second Lieutenant Jacob, and accompanied by the surgeon, Dr Bullimore, and reached Launceston at half-past one. The Launceston Fire Brigade, headed by the Mayor and a band of music, went some distance on the road to meet them, and with a great number of people escorted them in the town, walking in procession through Broad-street, Church-street, and High-street, where the Falmouth Brigade met with a hearty reception. Drill commenced in the presence of a large concourse of people, amongst whom the members of the Launceston corps could be distinguished by bands around their left arms, shortly after two, in Broad-street. The town possesses an excellent supply of water under pressure, so that the capabilities of the engine could be well displayed. The Launceston engine was likewise tried, and acquitted itself well, throwing a jet of water considerably higher than the East Cornwall Bank. That which most attracted attention was the drill of the Falmouth Brigade with their ladders, life-lines, and jumping sheets, illustrative of various modes of saving life. Mr Clemo, one of their band, was “rescued” by being “bowsed” out of a three-storey window garbed, in order to give reality to the scene, in attire which was certainly indicative of the period at which fires generally burst forth. Messrs Skinner, Bowden, and Jones shewed their pluck by leaping from considerable heights into the sheet. The engine was drawn by an active posse of willing volunteers (who afterwards found pulling it back a difficult matter) down to the Newport-square. Here the drill was repeated, and here Messrs Orchard and Crocker, of the Launceston Brigade, emulated the daring of their Falmouth friends by leaping from the top of the inn. This filled everyone with surprise, that without any practice, they should have the courage to jump from such a height without the least timidity or hesitation. A couple of their comrades valiantly rushed up the ladder after them to follow their example, but their hearts failed them at the last. They lingered trembling at the brink, and feared to jump away, amidst the ridicule and laughter of their townsmen, and then, meekly descending, subsided again into oblivion. The drill was of the most satisfactory character, and was enjoyed by all except a few country cousins, who evidently though they were to have been treated to the genuine article – real fire and thrilling escapes, as well as real engines and real water – and felt disappointed accordingly. At six o’clock the Falmouth Brigade was entertained to dinner at the White Hart. The Mayor presided, with Mr Gifford in the vice-chair. After the loyalty of the company had been duly displayed, the Mayor proposed the health of the Falmouth Fire Brigade, coupling with the toast the names of the officers – Capt Olver, Dr Bullimore, Lts. Latchmore and Jacob. On behalf of Launceston he thanked their friends heartily for the manner in which they had responded to the invitation. There drill had not only been highly interesting, but exceedingly valuable, and he believed that the good people of Launceston would profit by the lesson they had received. He looked upon it as of the utmost importance for a community to be prepared to meet the outbreaks of fire. In Launceston they had been very fortunate; but they could not always hope to be so, and he was glad that a brigade had been formed. We think it right to state that the dinner was on the table, smoking hot, precisely at the hour named, six o’clock. Many gentlemen were present to enjoy the company of their Falmouth friends, and they all appeared thoroughly to enjoy the good things placed before them. The concert which followed, was attended by a crowded audience. The flute solo by Mr T. Symons, was much appreciated. The nightingale’s Trill, by Miss M. Pearse, was beautifully executed with her usual ease and grace. It finished with the Falmouth corps singing the Fire Brigade song. Launceston Volunteer Fire Brigade posing outside their Station in Market Street. THE LAUNCESTON VOLUNTEER FIRE BRIGADE. (East Cornwall Times, Saturday January 10th, 1874). NEW FIRE BRIGADE. TRAINING AND TESTING. The first public drill of the new fire brigade was held on the 28th March, 1874, and the engine was then housed in the Butcher’s Market yard. 1874:- Launceston Volunteer Fire Brigade: NIGHT ALARM. The officers of the Brigade wish to test the zeal and activity of its members by causing an alarm to be made in the night, by the ringing of the Fire Bell in the church Tower. The Inhabitants are requested to take notice, that, within a fortnight, this night summons will be made, and they are not to be alarmed if the Bell awakes them from their peaceful slumbers. Due notice will be given of all Night Drills. John Ching, Captain. Geo M Gifford, Secretary. April 7th, 1874. East Cornwall Times, Saturday, 18th April, 1874. FIRE ENGINE STATION, (BUTCHERS’ MARKET YARD). Hon. Sec. And Treasurer, G. M. GIFFORD. The MAYOR, a Member ex-officio. Treasurer’s Account of Receipts and Expenditures from May, 1872, to April, 1874. “ JR Shepherd 10 0 £ 185 17 1. Rev W Martin 5 0 £ 185 17 1. Fire Brigade Subscriptions, & c., 2nd April 1881. Balance Sheet for Fire Brigade to December 31st. 1880. The annual drill and dinner of the above Brigade were held yesterday, but owing to the heavy fall of rain the operational drill was only partially gone through in Castle-street, the men getting a good soaking whilst doing it. The dinner was provided by Mr W. Cudlipp, The Bell Inn, upon whom it reflected great credit. About three dozen sat down. After ample justice had been done to the provisions, and the health of “The Queen”, “The Prince and Princess of Wales, and other members of the Royal Family,” had been toasted, the Captain (Mr J. Ching) proposed “Success to the Launceston Volunteer Fire Brigade.” He stated that although two years had passed since the Brigade became incorporated they had not been called upon to show the prowess and skill in danger which they were ready to display when they had the chance. But, during the past year, several narrow escapes had been witnessed in the town, including those at the houses of Mr Woolley, Mrs Thomas, and Mr Nicolls, which might have caused great destruction. He hoped the fire would not come, and that the men would show themselves ready for emergency. Many persons in the town and neighbourhood had responded most liberally to their appeals, and he thought the money had been well expended. Mr Ching, in responding, thanked Mr Pearce for his remarks and said he was deeply anxious that the Brigade should become efficient. Their rules made it compulsory that any of the members who had neglected three consecutive drills without a valid excuse should be expelled, and that it was desirous of putting that law into execution for the benefit of the Brigade. Fire Brigades were becoming national institutions; Falmouth, Penzance, Camborne, Bodmin, and many other towns in Cornwall had them, and as the town had so liberally supported them it was their duty to become efficient. He wished them all health and a prosperous new year. The Secretary (Mr Gifford) stated that there was a balance of about £4 against the Brigade but that the subscriptions which were due would clear off the amount, and that the accounts would be published in due time. He thought the men should be provided with a pair of water-proof boots, and said that a sum of £30 would cover the expense of purchasing them. Mr W. R. Bray offered half-a-guinea towards purchasing the boots. Several other speeches of minor importance followed, and the company dispersed well pleased with the satisfactory condition of the Brigade. Launceston Volunteer Fire Brigade: The Brigade will meet at the engine station on Monday week. The Fire Bell will be rung at 11.45 and continue to ring until 12, by which time the officers and men are expected to be in their places. The brigade will leave the market house yard at half-past 12 and proceed to Lezant. The first drill will take place at Landue Bridge, and from there the brigade will proceed to the Rectory where a jumping drill will take place, a wet drill to follow. After the luncheon there will be a ladder drill, and some members of the brigade will jump from the top back windows of the Rectory. The day’s proceedings will close with a wet drill. East Cornwall Times, 6 January, 1877: Launceston Fire Brigade. The Members of Launceston Fire Brigade had their Annual Supper on New Year’s Day, the substantial repast being provided at the station adjoining the Butcher’s Market. East Cornwall Times, 16 June, 1877: VOLUNTEER FIRE BRIGADES. We have received the first number of a new monthly publication, THE FIREMAN, devoted to all matters connected with the extinction of fires, and contains a large amount of information interesting to all, embracing particulars of the formation of Voluntary Brigades, and their duties, all new inventions for the suppression of fires, a list of fires for the past month, &c., &c. We particularly notice a well executed engraving of a fire in Japan, with Merryweather’s specially constructed engines on a small scale worked by the natives of that country. We publish the following in extenso, heartily recommending the publication to the notice of our own smart brigade, as well as others which we see by the local prints are being established in the adjacent towns. 16 June, 1877: PROPOSED ASSOCIATION OF VOLUNTEER FIRE BRIGADES. We understand that in view of the rapidly-increasing Volunteer Fire Brigade Movement, it is intended to organise an Association of Brigades for the consideration of questions affecting their interest of volunteer firemen, and for the promotion of the general efficiency in Volunteers of Brigades. The following are among the objects proposals – the formation of a Benevolent Fund for volunteer firemen injured while on duty; the provision of competent Inspectors to voluntary brigades who wish for instruction; exemption from jury service for fire brigade officers, as an acknowledgment from the Government of the movement; the same facilities in railway travelling for firemen in uniform as the military enjoy; more satisfactory arrangements with insurance offices for the payment of voluntary fire brigade claims; and the formation of a system of communication throughout the country. A number of brigades have already given their adhesion to the movement, and Mr Chas. M. Foottit, of Marlow, will be happy to receive communications and answer inquiries. Letter to the Cornish & Devon Post, Sat 9 July, 1881: To the Editor: Sir, The season of the meetings of Fire Brigades is at hand, and on the South-East coast we expect to have many social gatherings to compete for prizes of the best Brigade collectively, and for individual members of Brigades. May I ask through your columns whether there is any intention of a similar demonstration at Launceston. “The Fireman”, 2 Grocer’s Hall Court, Poultry, EC. Launceston Fire Brigade Drill: On Thursday week (2nd Feb, 1882) the Brigade had a capital moonlight drill and thoroughly tested the small engine, which is now ready for any emergency in the country, having been thoroughly well put in repair and mounted on wheels by Mr T. Coombe, of Kensey Foundry. Mr Graham White, lieutenant, and Mr Balkwill, the Secretary of the Fire Brigade, attended to ask the Board if they would grant seven or eight hydrants for various parts of the town in order that the Fire Brigade might be able to work their engines more efficiently in the future than in the past. He said that if the fire in Fore Street last week had taken a more serious turn than it fortunately did it would have rendered the aid of the Brigade very much less, as the hydrant near the place was useless. They tried the hydrants last Thursday and there was not one in the town at which they could test their little engine, and such was the state of things at that fire that their only choice was to take the little engine to Fore Street and feed it from their big engine in High Street, thereby losing the use of one engine. He produced a sample of a hydrant recommended by Messrs Merryweather, the eminent fire brigade engineers of London, and added that after inspecting the town, the officers of the Brigade recommend that a hydrant should be fixed in the following places:- Broad Street; Castle Street, opposite Mr Symonds’, the watch maker; in Church Street, near the Chapel; in St Thomas new road; in Newport Square; and outside Mr White’s in Tower Street. The Board generally were of the opinion that the hydrants should be provided, and it was agreed to order one to test it, and if found satisfactory, to order seven more and fix them at the places named. The entire expense, including fixing, will be about £20. 1st January, 1883: Launceston Fire Brigade: The members of the Launceston Volunteer Fire Brigade met on New Year’s Day and went through a satisfactory engine practice in Broad Street, under Lieutenants C. Hayman and G. G. White, and Engine-Overseer R. Robbins. In the evening the Brigade dined together in the engine house, under the presidency of Captain & Alderman J. Ching, who provided a substantial repast. August 11th, 1883. Launceston Fire Brigade: The members of the Launceston Volunteer Fire Brigade made good use of last Monday’s Bank Holiday by proceeding to Bude where their presence and drill occasioned a great deal of interest. September, 1886 – Tenders were invited for the building of a new Town Hall. Tenders received were: W Burt – £2,318; T. H. Langman included a Fire Engine House in his tender of £2,270; Mr C. Congdon – £2,160; Messrs J & M Strike & Dingle – £2,096; E. Doidge & Sons – £1,995; Mr J. Roskilly – £1,985; E Rendell – £1,835. The tender of Mr Rendell was accepted. Devon and Cornwall and Bolitho’s Banks, and, under the management of the efficient brigade was found to answer admirably. The Post & News of January 7th, 1893, carried the following report of the Launceston Fire Brigade’s Annual Dinner (part): Although Launceston is somewhat backward in adopting many of the latest inventions that smaller and less important towns have done, it has many instances of which to be proud. Not the least of these is “Our Fire Brigade”, which is second to none in the country, the rapid progress that has attended the efforts of those who have worked to help it in becoming so efficient being amply rewarded. The members receive every encouragement at the hands of the public with all necessary instruction from their worthy officers., and the smartness and efficiency attained reflect great credit on all concerned. Guests at the annual dinner included Mr G. Gifford, and Mr Ley Pethybridge, their Chairman, Lieutenant Hayman, Lieutenant Downing, Mr M. Body, treasurer, and Firemen Orchard, Philp, Barnicott, Wroth, Cottle, Brawn, Burnes, Lavers, Hamley, Shortland, Green, Ruse, Geake, Kennard, Atkins, Dew, Cudlipp, Jackson, and Carter. Fireman Kennard, who tendered his resignation two months ago, was wished an unwilling “Good Bye” by all on his leaving the town. Another resignation was also tendered and which should have special mention, that of Fireman Barnicott, one of the only two members left of the first party elected about 21 years ago; but as was observed, perhaps it is for the best, as younger blood will be more capable of fulfilling the duties, though not in any way reflecting on the work of the retiring member. Fireman Orchard is the only veteran left. The Annual Dinner of Launceston Fire Brigade: The annual dinner took place in the Engine House, on Tuesday evening (2 Jan, 1894). The officers, including Captain White, and Lieutenants Downing, Hayman, and Leamon, were prevented from attending due to ill health and other reasons, as were also Firemen Chapman, J. Daw, and Geake. The Secretary, Mr M Body was present at the commencement and ably took the chair. Others present included Firemen Orchard, Philp, Ruse, Wroth, Jackson, Cottle, Burns, Lavers, Hamley, W Daw, Sharland, C. Cudlipp, R. Atkins, H. Jackson, S. Carder, R. Green and Pinch. Throughout 1893 the Fire Brigade have been placed at a great disadvantage in drilling through the scarcity of water, some of the drills having to be postponed on this account, but we hope a brighter future is before them, and that the next year will not see them in a similar position. That water is coming is now a certainty, and to take advantage of it when it does come in making themselves more efficient than ever to grapple with fire no energy will be wanting on the part of the Brigade, thus enabling them to maintain their present position, which is second to none in the county. That they are well officered is a fact generally known and appreciated by both the members and the town. C & D Post, March 16th, 1895: Memorandum: The funeral of Mr Richard Green, late of Tower Street, took place on Friday afternoon and was largely attended. An impressive service was held in the Congregational Church, of which the deceased was a member, by Rev W. Miles. The members of the Fire Brigade in their uniforms, under Captain Hayman, and Lieutenant Downing, preceded the hearse to the cemetery, where they bore their late comrade to the graveside. The service at the cemetery was conducted by the Rev W Miles. Cornish & Devon Post, 29 May, 1903: LAUNCESTON DISTRICT FIRE BRIGADE. The New Uniforms; The Fire Brigade Committee met in the Town Hall on Friday last, and distributed the new uniforms to the firemen. The Brigade marched into the Town Hall with their Captain (W. D. Philp) at their head, and were put through a drill. The Mayor handed over the uniforms with a few appropriate remarks. On the motion of Dr Andrew, seconded by Captain Dingley, and supported by Mr Philp, a vote of thanks was accorded the Mayor. The Mayor and Committee then made an inspection of the Fire Station, and of the equipment of the Fire Brigade, and pronounced themselves fully satisfied. Town Council Report, 24 June, 1903: The Fire Brigade. A report from the Fire Brigade stated that the hydrants had not yet been supplied. Mr F. Trood has been elected to fill the position of lieutenant in the place of Mr Thorp. The debit balance had been reduced, and much of the credit of that was due to Captain Philp. During the coming year a large expenditure was absolutely necessary as all the men required uniforms, the majority being in use since the formation of the Brigade. The balance now stands at £1.3s.10d. The annual report of the Fire Brigade Committee is now before us and we are glad to note that a satisfactory tone prevails. The balance-sheet shows a balance in hand of £2. 6s. It might be small, but it is certainly better than a balance on the other side. It is encouraging to see that the subscriptions have again slightly increased. We hope with the committee that the next year additional subscribers will be found, particularly as it is likely that further expense will have to be incurred in providing new appliances. The Brigade has not been called upon to attend any fire during the year. This is a happy condition of thing, and may such continue. The Brigade is not likely to get rusty for want of work, for we find that the drills are regularly attended, and if at any time a call for active service is received, we feel sure that under the able officership of Captain Philp and Lieutenant Grace the men will not be found wanting in their duties. NEW STEAM FIRE ENGINE. ROYAL DONATION. A letter was read from Mr W. T. Mills, secretary of the Launceston District Fire Brigade, stating that, as desired by the Town Council, the Fire Brigade Committee had made an appeal to the residents and property owners for a subscription towards a steam fire engine for the town and district, and the sum of £123. 3s. had been promised. The Committee considered they would be able to increase this amount to something like £150 as there were some further replies to be received to the appeal. The Fire Brigade Committee recommended the Town Council to provide the balance, and to at once proceed with the purchase of the steam fire engine. In a subsequent letter Mr Mills stated that £25 having been promised from His Royal Highness the Prince of Wales, the total subscription now amounted to £147. In answer to Councillor Fraser, the Mayor (Cllr T Wise) said the cost of the proposed engine would be about £300. – Alderman Kittow observed that the contributions amounted to nearly £150, and he thought the effort of Mr Mills a very commendable one. The outside public had responded very liberally, as it was thought they would do. (Hear, Hear). He (the speaker) was sorry, however, that the insurance companies had not fallen into line. He contended that the time had now come, seeing that it was so well supported by outside people, for the Council to move in the matter and get an up to date fire engine. (Cheers). They all knew that their present engine was not reliable in case of fire outside or inside the town. Mr Mills had made enquiries and it appeared that a loan for a fire engine could be obtained and spread over ten years. Supposing that the engine cost about £350 – and there were requisites as well – it would mean that they would have to borrow £200. If they repaid the interest and principal at the rate of £12 per cent it would mean £24 per year. As a Council they had said that they would vote £20 a year for the upkeep of the Fire Brigade, so that they would probably mot have to pay more than that, for he thought the other £4 a year would be given in subscriptions owing to increased interest. The Mayor observed that he did not think that they would want to borrow £200. – Alderman Prockter suggested that the Fire Brigade Committee settle the specifications and then invite tenders. – Councillor Symons though the Council should first decide to vote the money – Councillor Hender said the country people had responded and that was as it should be – Councillor Prout said a sub-committee had been appointed to go into the matter of the cost and extras; but before they did that they wanted to know how the Council would deal with them. If the Council sanctioned the purchase they were prepared to go into the matter. Councillor Treleaven moved that the Council approve the suggested scheme for the purchase of a steam fire engine at a cost to the rates of about £200. Alluding to Alderman Kittow’s remarks, Councillor Treleaven said the upkeep of the engine would be more, and by repaying the £200 the Council did not free themselves of the liability for the upkeep of the engine. Alderman Kittow said he believed the upkeep would be less as less men would be required. Councillor Hender, in seconding Councillor Treleaven’s motion, said the public had been liberal, although the list was not a large one, as regarded numbers. Councillor Prout intimated that some of the donations were promised on the understanding that the engine was procured during 1911; the motion was put and carried. April 29th, 1911. NEW STEAM FIRE ENGINE. The Fire Brigade Committee recommended that a new steam fire engine be purchased from Messrs Shand, Mason, & Co., at a cost of £320, appliances £18, total £338, less £15 allowed for the two old engines, so that the amount to be actually paid was £323. Subscriptions promised £147. 3s., balance to be provided by Town Council being £175. 17s. The engine would be capable of throwing 260 to 300 gallons of water per minute. May 6th, 1911. LAUNCESTON’S NEW FIRE ENGINE. “It is a light but powerful machine of Messrs Shand, Mason, & Co’s patent “Double Vertical” type as adopted by the London Fire Brigade, who have in use no fewer than 54 steam engines of Shand, Mason & Co’s construction. The Shand-Mason ‘double vertical’ steam fire engine may fairly claim to have set the fashion in the fire engine world, having been adopted by the leading fire brigades throughout the country. Engines of this popular type are in use in very many large towns. The principal features of the Shand-Mason “double Vertical” engine is a twin double-acting steam cylinder working directly upon a corresponding pair of double-acting pumps, the whole being placed vertically at the rear of the quick-steaming boiler furnishing the motive power. Two piston rods convey the movement of each piston to the pump rod, and the movement is communicated to the double-throw crank-shaft by connecting rods of new and special form running from a joint in the headpiece of each pump-rod. The new arrangement, which replaces the less effective crosshead, while facilitating the smooth working of the machinery, minimises friction, thereby considerably lessening the wear and tear. The design of the engine ensures a steady flow of water whether at high or low pressure and the machine works without noticeable oscillation, a very important consideration as the vibration and movement present in some types by continually chaffing the hose materially reduces the length of time it would otherwise last. Other points of the Shand-Mason double-vertical are the simplicity of design, the rapidity and ease with which the various parts can be got at for cleaning and examination, and the lightness of the whole machine in comparison with its power and capacity. The boiler is the firm’s patent inclined water-tube type and with the aid of the new Shand-Mason quick-steam-raising apparatus is capable of raising steam from cold water to 100 lbs pressure per square inch, in about five minutes while stationary, or a short time longer while travelling without stoking whatever. Stoking-en-route at the best is neither a safe nor easy task, is accordingly rendered unnecessary. The fire is lighted on leaving the fire station, or at any part of the journey without stopping, by means of the simple lighting apparatus fitted at the front of the boiler. A further important advantage is obtained by the use of the new quick-steaming apparatus in that the engine starts working with a full body of fire in the furnace and there is no risk of a temporary reduction of steam pressure when the engine commences working. The Engineer being away from the hose and suction-pipe connections and having all boiler gauges and fittings within easy reach can perform his work better; the position is more convenient for cleaning, oiling, etc., and the centre of gravity is kept low, allowing the engine to travel more easily and safely; the design of the engine is less cramped and a lower position of the suction chamber is permitted, which is very useful when working from a depth. The boiler fittings and feeding apparatus are complete and well adapted to their several purposes, and bear important improvements lately introduced. Alternative means of keeping the boiler supplied with water are provided to meet all contingencies. The lubricating arrangements have been very carefully designed, and are thoroughly effective and as far as possible self-acting. The Shand Mason “Double Vertical” though light in weight is strongly built, steel entering freely into the construction of both carriage and frame. The parts of the machinery with which the water comes into contact are gun-metal, bronze, or other non-corrodible metal. The engine will be mounted on strong, high, wood-spoke wheels, with steel axles, springs and side frames and is furnished with a full sized horse-box, the lid of which forms seats for the firemen. When fully stored with the necessary hose and other gear, and with men mounted, the machine can be rapidly drawn by a pair of horses or for near-by fires can be dragged by hand. The pumping capacity of the Launceston Steam Fire Engine will be 200 – 300 gallons per minute, and it will throw a one and one-sixteenth inch jet to a height of 150 feet, and as many as four strong jets simultaneously to good working height. The engine will be finished in handsome style, the woodwork painted vermilion and the bright metal parts highly burnished, and the name of the town painted on the sides of the hose box. September 2nd. 1911: C & D Post: LAUNCESTON – After years of agitation Launceston is at last in the possession of a steam fire engine – an engine of which the town might well be proud. It arrived at Launceston on Wednesday (30 August), and the Fire Brigade Committee decided that the inaugural ceremony should take place in Broad Street on Thursday next, September 7th, when Mrs JC Williams of Werrington Park, will start the engine. Mr W. T. Miles, the energetic secretary, is making full arrangements. Launceston Town Council took delivery of its new Steam Fire Engine on Wednesday, 30 August, 1911, and promptly named it “DUNHEVED”, and on 7 September, it was so named by Mrs J. C. Williams, of Werrington Park. INAUGURAL CEREMONY: The engine was named “DUNHEVED”*, to continue into perpetuity the name of one of the older engines now obsolete. The old engines had done 100, and 70 years, service respectively. Mrs JC Williams lit the boiler by means of a torch and steam was got up in about the prescribed time, and, within a few minutes a stream of water was seen shooting straight into the air. The engine was put through a thorough test and came out satisfactorily after which a fire escape demonstration was given by members of the Brigade. The members of the Brigade are: Captain WD Philp; Lt AW Grace; Secretary William T Mills; firemen – Messrs H Wroth; E Sharland; SW Carter; W Pinch; W Dew; C Northcott; W Jordan; C Medland; C Cottle; W Hambley; A Hodge; and E Martin. The demonstration was repeated at Newport. January 3rd, 1914: C & D Post: ELECTED CAPTAIN OF LAUNCESTON FIRE BRIGADE. We have pleasure in announcing the election of Major J. Dingley, JP., as Captain of the Launceston & District Fire Brigade, rendered vacant by the death of the late Mr W. D. Philp. We agree that no better person could be found to fill the position, for Major Dingley, who has been on the Fire Brigade Committee for over thirteen years, has shown his ability to take charge of a number of men, he having been in command of the local Volunteers, and later, the Territorial company for some years. He takes a very keen interest in all matters affecting the welfare of the town, and we tender him our best wishes on his selection, with the hope that the calls on his services for action duty will be very rare. Cornish & Devon Post, Sat, March 20th, 1920: FIRE BRIGADE TO BE MOTORISED. Motor Fire Engine for Launceston: To the Finance Committee, it was reported the Fire Brigade Committee forwarded a recommendation that a motor lorry be provided for the use of the Brigade when fires occurred at a distance from the town and that the adjoining district councils might be asked to contribute to the cost. The Council resolved to ask the Fire Brigade to enquire as to the cost of a motor fire engine. In 1923 Claude Raddall was captain of the Brigade and Mr W. T. Mills, lieutenant and secretary. In the May 10th edition of the Cornish & Devon Post, 1924, a letter to the Editor suggested the Fire Engine be mounted on the back of a lorry to enable to Brigade to move more quickly to fires outside the town. Cornish & Devon Post, 31 May, 1924: FIRE BRIGADE EXPERIMENTS. As a result of an experiment made on Monday evening Launceston Fire Brigade will be in a somewhat better position to deal with fire occurring in the country. In the past great difficulty has been experienced in getting the necessary horses. On Monday the “steamer” (fire engine) was attached to a Fordson tractor belonging to Prout’s Garage, Ltd., and in company with the Fire Brigade Committee and others, was taken for a demonstration run into the country. The demonstration was the result of a kind offer of Mr W. R. Prout’s to tow the steamer to fires by means of this tractor. He intimated that he would be prepared to allow the tractor to stay at the Fire Station, and to provide a driver, promising to give a demonstration as soon as possible. Mr Prout will make no charge for the tractor for at least twelve months. The tractor and steamer, with nine persons, including the Mayor, the Chairman of the Fire Brigade Committee, rode on the steamer while members of the Fire Brigade followed in motor cars and witnessed the demonstration. To Pennygillam, thence to Pages Cross, Stourscombe, down Bulsworthy Lane, returning through Exeter Street. The steamer was towed in a satisfactory manner, there being no sway with the steamer, and all corners were negotiated successfully: on the steep Bulsworthy Lane the tractor was able to hold back the steamer without the brakes being applied. The steamer weighs thirty-two hundredweights, and with the men on it on Monday, it is estimated that the tractor towed from two-and-a-quarter to two-and-a-half tons. The Committee was satisfied with the first test and have accepted Mr Prout’s kind offer. It is hoped to make some further tests in the near future and in all probability the steamer will be taken by tractor to Yeolmbridge on the 6th of next month, when the steamer will be worked pumping water from the river. P&N May 7th, 1932: Launceston Rural Council has turned down the Town Council’s suggestion that they join together to buy a £900 motor fire engine. P & N January 29th, 1934. Presentation to Captain William Thomas Mills, chief officer of Launceston Town Fire Brigade, on his retirement after 29 years service – 1905 – 1934. Launceston Town Council and Fire Brigade have made presentations to Mr W. T. Mills, who for 25 years has been secretary of the Fire Brigade and for ten years its Chief Officer. During the time Mr Mills has been connected with the fire brigade he has seen the brigade brought more up-to-date, although it is well-known that he is keenly disappointed that the rural district did not fall into line in connection with the proposed purchase of a new motor fire engine. Many of our readers will remember the old manual engine which was last used at a fire at Pennygillam in 1911. On that occasion it would not function, and within twelve months a new steam fire engine was obtained. For the purposes of the town itself the present engine is probably all that is required, but it is useless for the country districts, from which many calls have in recent months been received and, of course, turned down. 3rd March 1934, Post & Weekly News: Motor Fire Engine For Launceston? The question of a motor fire engine for Launceston has arisen on many occasions, the inefficiency of the present fire fighting equipment, at least as far as the country district is concerned, being well known. On Monday, the Mayor, Town Clerk, Councillors and County Councillors watched a demonstration of a Standard Bedford Fire Engine at Newport. The Mayor and Councillors also inspected the Bedford refuse collecting lorry with interest and noted the modern equipment. The motor fire engine was not so expensive as the one in question a few years ago, the cost being between £500 and £600. The engine demonstrated was equipped with 350/400 gallon, self-priming Pulsometer pump capable of working four fighting hoses, each sending a powerful jet of water to a height of 80 feet. The pump is driven by a motor engine. Members of the Ambulance inspected a Bedford Ambulance that was on view with the fleet of Bedford cars. A tipping lorry was also on view. When a representative of the “Post & news” asked Mayor Gilbert his opinion on the matter, he said that Launceston was behind the times in this matter, and expressed the desire to see Launceston modernly equipped in these respects. April 28, 1934. Post & Weekly News: Launceston Fire Engine. Rural Council Discuss Question of Rural Water Supplies. At a meeting of the Launceston Rural District Council, held on Saturday, the question of a fire engine again came forward, arising from a letter from Launceston Fire Brigade Committee. The letter stated: ‘That since the Council last discussed the question of the provision of a motor fire engine which should be available for use in the district, the necessity for such an engine has been proved by the fact that more than one call to deal with fires in the rural district has been received by the Fire Brigade.’ The Clerk (Mr G. G. Williams) said that he had written for further details as to where the fires in the rural area had taken place, and whether any water was available, but had not yet received the information. “It will be very desirable if the District Council can join with the Town Council in getting a fire engine, provided there is likely to be a supply of water when the brigade reaches the places where they are required,” remarked Mr G. T. Perkin. He was afraid that in many places in the country they would find a scarcity, if not an entire absence, of water to deal with a fire. Mr W Goodman: ‘I think seventy-five per cent of the places would be minus water.’ The Clerk remarked that a new fire engine would cost less than when they last discussed the question. Estimated to cost the rural district a 4d rate, Launceston District Council on Saturday decided to accept the Town Council’s offer for the provision of a new fire engine. Conditions of the offer were that the rural district contribute one-third of the cost of the engine, after which the Town Council would be responsible for its maintenance. C & D Post, 13 July, 1935: LAUNCESTON’S MOTOR FIRE-ENGINE. FAVOURABLE IMPRESSIONS OF DEMONSTRATION: A POWERFUL MACHINE AT A MODERATE OUTLAY. Launceston is now provided with a motor fire-engine, but although it is not a brand new one, judging by the demonstration at Newport on Friday evening, it is a powerful engine that seems capable of overcoming the fiercest of conflagrations that might occur in the borough. The Mayor [Mr WH Gilbert], Aldermen and Councillors, and a crowd of townspeople watched the engine being put through its paces by members of Launceston Fire Brigade, under the Captaincy of Mr J Burford, and two representatives of the Neath firm, from whom the engine was purchased. The demonstration gave a favourable impression and a member of the Council opinioned to a representative of “The Post & Weekly News” that it was a powerful engine in excess of any other they had seen, purchased at a quarter of the cost and capable of serving the town for many years. The River Kensey provided an unlimited source of water for the demonstration which was held near St Thomas Church. There was a little misgiving in the minds of some, however, as to the Council purchasing a second-hand engine. After witnessing the engine supplying five hoses, forcing five streams of water to a height of about 80 feet, those present appeared to be satisfied that the Council had exercised wise judgment. It has a 50-60 hp Dennis engine that, in addition to being able to propel the vehicle to the scene of a fire at a cruising speed of 30 mph, or a forced speed of 50 mph, also supplies the power to the 500-600 gallon per minute wind turbine at the rear of the engine. This turbine is capable of lifting 27 feet of water to the pump in about 30 seconds. The whole appearance of the engine suggests strength and power, and that it is an engine of no mean order is evidenced by the fact that it has been in the possession of London County Council. There is seating accommodation on either of the sides (on which is inscribed “Launceston Borough”) for ten men, whilst two more can ride with the driver in the front. A large hefty, fire bell is placed in the front. Equipped with pneumatic tyres good road holding at high speeds is assured, and to get the Brigade quickly off the mark as soon as the alarm is given, dual ignition makes the motor immediately responsive. The Brigade’s engineer is Mr F Hocking, who it is understood will also act as driver. Alderman C. Raddall, Councillors W. E. Miller, R. Gregg, and Mr J. Burford, who formed the deputation who visited Neath and inspected the engine in the first place, are to be congratulated on their sound judgment, and now, after a long time being in abeyance, Launceston has taken another step forward in her progressive career. Mr Bromell (Chairman of Bude-Stratton Urban District Council) was among the interested spectators. It was reported that acting on the recommendation of the sub-Committee (Alderman Raddall and Councillors Hiller & Grigg) the Council had purchased a reconditioned Dennis Motor Fire Engine for £350. Councillor Hart said their thanks were due to the sub-Committee. They had saved them at least £300 and he was told by the members of the Fire Brigade that the tests had been in every way satisfactory. . . .. ..
towards ¾ miles of hose pipe which was considered necessary for use in rural areas. could be called upon for traffic offence prosecutions. P & WN, Sep 21, 1935: At a Council Meeting on Monday, it was decided only St Mary’s fire bell be recognised and St Stephens bell should not be rung. The fire brigade did not turn out when St Stephens bell was rung for the fire in a council house at St Stephens, but when St Mary’s Fire Bell was rung the brigade responded in nine minutes. In 1879, Mr Otho B Peter, architect, of Launceston, was engaged to draw up plans for a large dwelling house at the top of Windmill Hill. This was to be the home of Mr Benjamin Ralph, first Headmaster of Dunheved College; he and his family moving in on completion in 1881, naming the new house “Craigmore”. Some years later the Ralph family emigrated to Canada and the house was taken by the Peter family, solicitors in the town. Otho, brother of the solicitors Peter, was requested to make some alterations and additions to the house, some of which included a flat roof area. During World War Two the occupant was Mr Gerald Peter, solicitor, retired Royal Artillery officer; using his service experience Mr Peter was appointed Chief Air Raid Warden for the town and he duly authorised his wardens to use the flat roof as an observation post during local air raids for the rest of the war. Post & News, January 25th, 1941: FIRE BRIGADE. Council Meeting of previous Monday. A Minute of the Fire Brigade Committee was read – “On the motion of Councillor Fitze, seconded by Alderman Trood, it was recommended that a new motor fire engine be purchased.” The Mayor advised waiting for the Ministry as to the Town Clerk’s enquiring if a grant was available. The Mayor pointed out that it was only about four years ago the Town Council spent about £500 on an engine. Councillor Fitze said the engine was unreliable when requests were made to turn out to other towns. Councillor Miller, Captain of Fire Services, pointed out that when the engine was purchased there was no question of its being driven as hard as possible to fight fires caused by an enemy. The National Fire Service (N.F.S.) was formed by amalgamating all the existing local fire brigades and the Auxilliary Fire Service (A.F.S) in 1941, under the auspices of the Government of the day. This was due to non-standard equipment and procedures causing problems during World War II, when fire appliances and crews were mobilised outside their own areas to assist with the bombing raids of the blitz. April 26, 1941: New Fire Engine For Launceston: The following minutes of the Council in Committee was passed: ‘The Town Clerk reported that as a result of Councillor Miller’s [Chief Officer of the Fire Brigade] visit to London and interviewing officials at the Home Office [Fire Brigade Division], he had received a letter from the Secretary of the Home Office [Fire Brigade Division], dated 27 March, 1941, that he was prepared to recommend to the Ministry of Health that sanction be given to the loan necessary for the purchase of a John Kerr Drysdale Fire Engine, at a cost of £1,275. Councillor Miller was thanked for the services he had rendered. Post & Weekly News, Sat 24th Feb, 1945: LAUNCESTON ALARMED: CRITICISM OF FIRE BRIGADE SYSTEM. No Reply to Telephone Call: The system of calling the local Fire Brigade came in for severe criticism at Monday’s meeting of the Launceston Town Council, when it was alleged that there had been avoidable delay in the arrival of the Brigade at two recent fires, and when a fire occurred the previous day (Sunday), an official of the Council, having smashed the glass of the call-box near the Fire Brigade Station could get no reply to his telephone call. The matter was brought forward by Alderman W. H. Gilbert, who said it seemed that the present method in use for the calling of the Fire Brigade was neither convenient nor satisfactory. With the possibility of enemy raids now being very remote, there would seem to be grounds for revising the method. He understood that, owing to telephone calls having to go to Bodmin or Liskeard, there was some delay in the cases of two recent fires in the Borough by which valuable minutes in the early stages were lost and might have had disastrous consequences. The local Brigade were to be complimented on the prompt manner in which they turned out, but, continued Alderman Gilbert, he understood they were unable to do so until they received orders from Liskeard. People at that distance required all sorts of information which would be well-known to the local Brigade, and whilst these particulars were being obtained it would seem that the fires had to burn. There was considerable criticism by members of the public when a fire occurred at the offices of “The Cornish & Devon Post” on Monday in last week. Although the local Fire Station was a matter of only 200 yards away it was some time before the Fire Brigade arrived on the scene and he believed it would not have been on the spot for some time after had not Mr Quick observed the fire and himself rushed to the Station and got out the pump. Only three minutes elapsed from the time Mr Quick went and the arrival of the Brigade, clearly demonstrating that the local Brigade could turn out promptly once they received the call. Local residents were becoming alarmed, and the local Brigade was receiving undeserved criticism. The Mayor (Alderman G. E. Trood) said a fire occurred at the Westgate Inn on Sunday. Mr AE Jones went to the call-box near the Station, broke the glass, and endeavoured to put through a call, but got no reply, and he had to go to his (the Mayor’s) house to telephone. Councillor Philp said it was time something was done in the matter. They had a bell system which worked satisfactorily in normal times. Why they had to send to Liskeard he did not know. Alderman Gilbert: To me it seems ridiculous. Whilst people are asking for detailed information the fire is burning, and in the case of a fire the first ten minutes is vitally important. Councillor Harcup remarked that it might be owing to the war set-up of the fire organisation. Unless that was changed it might happen again. The Mayor: The box outside the Fire Station is useless. You cannot get a reply. Councillor Fitze suggested that the Town Clerk should get in touch with authorities on the matter, and this was agreed. There were around one thousand six hundred different fire brigades in the various County Borough, Borough, and Urban and Rural District Councils under the provisions of the Fire Brigades Act which became law on the 29th July, 1938. In the few months before the outbreak of war the Rural District Councils relied upon the old Volunteer Brigades, attempting to co-ordinate their efforts and where possible, providing more modern fire fighting machines and equipment. The 1947 Act reduced the number of brigades nationally to 147. Cornwall Fire Brigade began on 1st April, 1948. Twenty-nine Stations were fully operational on the appointed day, including Launceston. In twenty-three of these towns there was a tradition of fire fighting before the war and local fire units were also in being at four other towns. By the mid-1990’s Cornwall County Fire Brigade had thirty-one stations in eight areas. Post & News, 30 January, 1954: CORNWALL FIRE SERVICE – to cost more. When Cornwall County Fire Brigade committee approved estimates for 1954/55 – £9,655 above the current estimates and amounting to £130,770 – at Truro, Wednesday week, Major TW Hodkin said that the figure did not show the whole picture and that the committee was actually proposing to spend nearly £180,000 on the brigade. Several members criticised the estimates as showing a rise rather than a reduction. It was decided in 1957 the facilities at the engine house in Western Road were inadequate for a modern fire service and a site in Westgate Street was purchased for a new, modern fire station. Tenders were invited by the council to build the first stage of a new station on 19th January, 1957 The site, from ancient times, was called ‘Belle Vue’, and was next to the Western Buildings, the offices of the Cornish & Devon Post. The buildings on the site were demolished and the new station erected, being opened on the 15th November, 1958, by Mr HM Smith, then Chief Inspector of Fire Services for the Home Office. Post & Weekly News, Saturday, November 22, 1958. Smart Operation at Launceston Ceremony: Official Opening of the New Fire Station. Synchronised with the removal of the Union Jack which had draped a commemorative plaque, the doors of Launceston’s fine new Fire Station in Westgate slid back swiftly on their runners, Saturday afternoon in a smartly-performed operation which threw the new station open for inspection by the public. The opening ceremony was carried out by Mr HM Smith, Her Majesty’s Chief Inspector of Fire Services, who also holds an advisory appointment with NATO. He was welcomed to Launceston by the Deputy-Mayor (Councillor S. E. Uglow), acting in the indisposition of the Mayor (Councillor T. Hicks). Mr Uglow, who also welcomed his colleagues from the Launceston and Broadwood Rural Councils and County Councillors and other guests, said that Launceston now had one of the finest and most modern fire stations in the county and they were thankful to the County Fire Brigade Committee and the County Council that this had been made possible. Launceston and district were very proud of its fire brigade, which was very worthy of a good station. Mr Smith, before performing the opening ceremony, told the assembled gathering that the average number of fire calls per year in England and Wales was over 100,000, and the loss by fire was also tremendous, amounting last year to a sum of £27 million. “But I am pleased to be able to tell you that in Great Britain we have at last halted – I hope, permanently – the rising curve of fire loss,” he went on, “although in every other country in the world it is growing still every year. “We in the United Kingdom have a fire service which is without equal in the world. Our firemen, both whole-time and retained, are well trained and efficient. Our appliances are excellent – but unfortunately our fire stations are not in the same happy state as our appliances and our men. Over 80 per cent of our fire stations are still most unsatisfactory and we are not up to the standard we should like to see. We have made progress, but I do hope it can be speeded up”. Mr Smith thanked the Borough Council for their part in the provision of the new Launceston Station and congratulated the County Architect (Mr K. Hicklin), and his deputy (Mr S. W. Warn) on their design, and the contractors, Messrs Hobbs & Knight, who had built it. He also congratulated the Cornwall Chief Fire Officer (Mr B. A. Christmas) and the officers and men of his brigade on the high standard of efficiency which they had reached. Mr Smith also thanked the County Council and the Fire Brigade Committee for all their support. Mr E Symons, chairman of the Cornwall County Fire Brigade Committee, was another speaker at the opening ceremony, and he detailed the history of the negotiations which had led to the provision of the new station. The site had cost £1,500; the demolition and site-works (carried out by Messrs E Dennis & Sons of Camelford), £4,600; and the building itself (erected by Messrs Hobbs & Knight of Bude and Launceston), approximately £8,000; a total cost approaching £15,000. The total number of calls on the Launceston Unit in the last complete year, he reported, was 46, and the average number of calls over the past ten years had been 34 each year. The Chief Inspector, who was introduced by Chief Fire Officer Christmas, presented long-service medals and RSPCA certificates to personnel from Mid and West Cornwall, and was himself presented by Sub-Officer S Hocking, senior member by age of the Launceston Unit, with a five-year diary and a pen from the Launceston Unit as a memento of the occasion. Those present included, in addition to the local borough and rural councillors and the respective Clerks, included Mr A. V. Thomas, Her Majesty’s Inspector of Fire Services; Mr H. W. Barker, Chief Fire Officer of Devonshire; Major D. P. K. Ryan, vice-chairman of the Devon County Fire Brigade Committee; Mr K Julian, Assistant Chief Constable of Cornwall (rep the Chief Constable); County Councillors; and other county and local officials and public figures. Afterwards the new station was open for inspection, and the guests were later entertained to tea at the nearby St John Ambulance Hall. The Launceston Unit held its annual dinner at the White Hart Hotel that evening to coincide with the opening and Chief Fire Officer Christmas resided over a largely-attended gathering. Mr W Reed-Johns (vice-chairman of Cornwall Fire Brigade Committee) proposed the toast of “The Borough of Launceston,” and disclosed that he himself was an Old Boy of Dunheved College. Living now at Helston, which he said, was much akin to Launceston, he spoke of the latter as the Gateway to Cornwall, which had repulsed various waves of invaders from the Romans onwards. And he warned, “invaders were on the move again. They have not got spears, arrows, of canons,” he declared. “They have black coats and striped trousers, and they carry little attaché cases. These “invaders” were the Boundary Commission, and he called for a united opposition to any attempts to alter the status of such ancient boroughs as Launceston and Helston. According to the White Paper on the subject, he said, the Mayor, with all the tradition, dignity, and ceremonial of his office, would become merely the chairman of the parish; visitors, he contended, came to Launceston to see the Castle, the parish church – and the Mayor’s regalia, and it was up to us all to preserve that. The Deputy-Mayor (Councillor S. E. Uglow) responded to this toast, and his namesake, Mr K. J. Uglow (Chairman of Launceston RDC.) Proposed the next one, that of “The Fire Authority.” In reply to this , Mr E Symons (chairman of the County Fire Brigade Committee) said that the Brigade’s efforts in connection with floods and with water shortages had brought home to the public of Cornwall that the Brigade did something besides waiting for a fire to start and they were now being accepted as a useful section of the community. He paid tribute to Chief Fire Officer Christmas, saying that in him Cornwall had a top administrator to rank with the best of any county in England. Responding, The Chief Inspector (Mr H. M. Smith) said the work of the Fire Services in the last war had earned it a place in the hearts of the public, and it should be remembered that in the United Kingdom 80 per cent of all the air raid damage in World War II was caused by fire – “What it would have been without an efficient Fire Service, the Lord only knows.” It pleased him that today everybody realised that as far as fire-fighting was concerned, there was no such thing as an administrative boundary, as indicated by the co-operation in coverage between Devon and Cornwall. The majority of firemen present that night were not professional firemen, and he stressed that the part-time retained man was just as much a part of the British Fire Service as his colleague serving in London and the other large centres. “He has a great sense of public duty,” declared the Chief Inspector, adding that geographically speaking the part-time firemen of this country covered some 80 per cent of the whole of the British Isles. “Without them, we should be faced, not only with the expense of new fire stations, but the expense of a whole lot more professional firemen.,” he pointed out, adding a final tribute to the wives for their support of their husbands, in their important work. Chief Fire Officer Christmas, proposing “The Guests,” expressed thanks to the County Fire Brigade Committee and to the County Council and its staff. He thanked also the building contractor, Mr J Hobbs, and his foreman, Mr WJ Ridgman, as well as the Deputy-Mayor, Council chairman and members and staff of their Councils, and the other distinguished guests. Major D. P. K. Ryan (vice-chairman of Devon County Fire Service Committee) responded. Following the dinner, for which Div.Offr. FPM Raynes was toast-master, this memorable day for the Launceston Fire Brigade concluded with a dance. 1962: OVER 500 TURN-OUTS IN CORNWALL. QUARTERLY REPORT BY CHIEF FIRE OFFICER. The Chief Fire Officer’s report for the last quarter of 1961, shows that in that period there were 515 turn-outs by the Cornwall County Fire Services. Figures for the local stations in that period are: Bude. 2 fires, 5 chimney fires and 2 false alarms, making a total of 9 turn-outs; Launceston: 3 fires, 9 chimney fires, 1 false alarm, 1 special services call, making a total of 14 calls; Wadebridge: 2 fires, 7 chimney fires, 1 false alarm, and 1 special services call, making a total of 11 call-outs. Delabole: 1 fire, 1 chimney fire, and 1 special services call, a total of 3 call-outs. Callington: 1 fire, 2 chimney fires, and 1 special services call, a total of 4 turn-outs. With the expansion of fire brigade duties and services the fire station in Westgate Street was found to be inadequate for 21st century requirements, and a new site was decided upon in 2002, outside the town, at Scarne. The first turf for the new fire station was cut on Tuesday, 16th July, 2002, at app. 14.20, on a green field site opposite ancient Scarne Farm. The completed building was handed over to the fire brigade on Friday 21st February, 2003, just one week later than planned. On Wednesday, 26th February 2003, the Westgate Street fire station was emptied of all equipment and machinery which was transferred to the new building at Scarne. The new station, costing around half a million pounds, was operational from around mid-day, but luckily the fire fighters had time to assess and familiarise themselves with their new accommodation before any calls came in. The first ‘Shout’ from the new station did not take place until 1350hrs on Saturday, 1st March, when attendance was requested at Bude fire station after reports of gas in the building. It was feared an explosion could be triggered by trying to start their own vehicles in an enclosed space. Just to prove they were ‘on the job’, a second Shout came at 1500hrs, this time to a road traffic accident, the Tender taking this call. 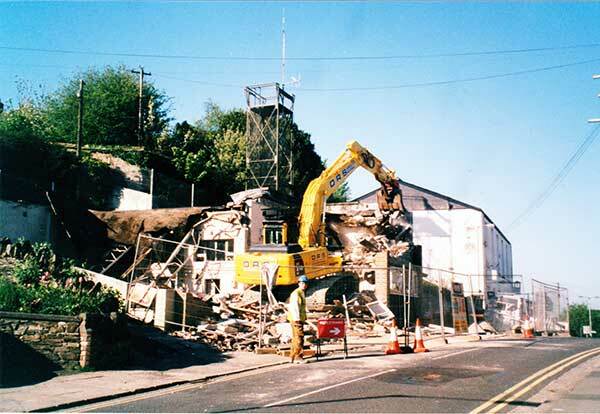 On Thursday 27th, workmen were taking down the building in Westgate Street directly opposite the old fire station. During this operation a roadside wall collapsed into the street, blocking it for a short time. On Friday, 28th, the brigade held an open afternoon for the benefit of local people and the children of the area, introducing themselves and their equipment and their new accommodation, and explaining why the new station was so important to everyone in the district. During March, 2003, the first full month after moving into their new headquarters, Launceston Fire Brigade received forty calls for their services; this equalled the previous record for any one month. The last calls were on Monday, 31st March, when there were six ‘shouts’. From Tuesday, 1st April, not one call out was made until Thursday 10th, when two calls within six minutes of each other around mid-day were made, followed by two more later in the day. One Hundred and Thirty-One Years Old, And Better Than Ever. On the evening of March 26th, while the Launceston Fire Brigade was engaged in their weekly training session, a local resident, Mr Jim Edwards, presented them with a card to commemorate the One Hundred and Thirty First year of their service as a fire brigade, the inaugural meeting having taken place on the 28th March, 1872. There were on the card around fifty signatures by local residents, tradespeople, customers and workers from the area of Scarne : some of the contributors – David S Smith, Messrs Maunder, Garden Machinery Centre, FOCUS, BWise, ShoeFayre, Co-op Homemaker, Ambulance Station, Hospital, Doctor’s surgery, and Kernow House. HONOUR FOR LAUNCESTON FIRE BRIGADE. Launceston Retained Firefighter Charles Spettigue has been selected from the Cornwall Fire Brigade to take part in the national remembrance parade in London. Charles told the ‘Post’ he couldn’t believe it when he heard the news that he had been selected. “I had a call from the deputy chief and he said that they had held a meeting of the three areas of Cornwall and the government had asked for a retained firefighter this year, and my name came up.